Initially founded with the intent to produce steam powered motorcars, Locomobile would eventually find its niche as a purveyor of fine quality, large scale luxury automobiles. The company started life in Massachusetts but quickly moved to Bridgeport, Connecticut where it truly established itself. 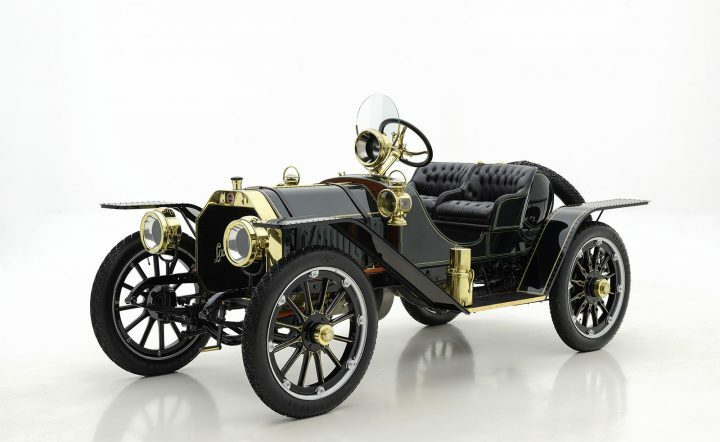 After giving up on steam cars in 1905 and focusing solely on petrol-power, Locomobile soon became one of the greatest names in American motoring. Their cars grew ever larger, more prestigious and more expensive by the year. One of the company’s greatest achievements came in 1908, when “Old 16”, a specially built Locomobile racer with a massive 16.9 liter OHV engine won the prestigious Vanderbilt Cup; the first such win for an American car in the face of fierce competition from the likes of Isotta, Daimler-Benz and Fiat. Locomobile’s primary competition on the sales floor came from Packard, Peerless and Pierce. In order to ensure its exclusivity in the face of the other manufacturers, Locomobile made the brash decision to limit production to just four cars per day. For 1908 the smaller, lighter Model 30-L joined the lineup (named for its 30 h.p. output). It was powered by a four-cylinder T-head engine but used all of the same high quality materials and construction techniques of its larger brethren, and thereby did not compromise on quality. In 1911, the Model 30 was joined by the six-cylinder Model 48 which came to be the mainstay of Locomobile production through the rest of the company’s life. William C. “Billy” Durant had purchased Locomobile in the early 1920s (following his second ouster from General Motors) and dreamed of putting the marque at the pinnacle of his next great automotive empire. Sadly, that did not come to be and Locomobile suffered the same fate as many of the great early luxury car makers, closing its doors in 1929 thanks to a critical lack of capital. This 1909 Locomobile Model 30-L carries a big T-head four cylinder engine and displaces 286 cubic inches. While it was named for its output, the actual power was closer to 40 horsepower, an excellent figure for a four-cylinder model of the time. While larger model Locomobiles relied on chain drive to put the power down, the smaller L-series utilized a shaft driven rear axle that afforded smooth and quiet operation with less maintenance. Inspired by the contemporary Panhard, Locomobile fitted the gearbox in the center of the car, which gave better weight distribution and positive action from the gear lever.